Light, natural, clean eating doesn’t have to be all about deprivation. There are so many dishes made almost entirely of fruits and vegetables that give you the same hearty satisfaction as some of the heavier dishes. Mushroom is my go-to vegetable during the time when I want to lay off meat and dairy. I find its “meaty” texture to be very filling and satisfying. Its somewhat bland flavor and spongy texture make mushroom a very versatile and inoffensive ingredient. Like tofu, it goes with pretty much anything. This simple stir-fry of assorted wild mushrooms is one of the most delicious meatless dishes I have ever eaten. Let me take that back. This simple stir-fry of assorted wild mushrooms is one of the most delicious dishes I have eaten. It features three kinds of fresh mushroom: oyster, shiitake, and king oyster, some green onions, some fresh garlic, and a simple brown sauce that is a cinch to put together. While only one kind of mushroom would be sufficient to yield a great result, using various types of mushroom in this particular dish gives you a rice or noodle topper that is both spectacular to look at and utterly good to eat. In one bite, you get the velvety texture of the oyster mushrooms, the spicy-toasty aroma of the shiitake mushrooms, and the voluptuous meatiness of the king oyster mushrooms (which I adore). You can add crimini, portobello (with gills removed), or even good old white button mushrooms to the mix. The idea is to play with various textures. To make this, make the sauce by whisking together 6 tablespoons of oyster sauce, 1/4 cup of soy sauce, 1/4 cup Chinese rice wine (Shaoxing) or brandy, 3 tablespoons of cornstarch, 3 large cloves garlic (minced), 3/4 cup of water, and 2 teaspoons of sesame oil. Then you cut 5 green onions into 1-inch pieces and set aside. Set a large pan over medium-high heat. A total of 3 pounds of assorted mushrooms, cut into bite-sized pieces, go into the pan with about 1/4 cup of water to get some steaming action going. For this dish, I do not want to brown the mushrooms; no caramelization is needed when you just want the velvety/meaty textures in a brown gravy. In fact, I don’t use any oil, except for the two teaspoons of sesame oil in the sauce. Once the mushrooms are softened a bit, but still remain firm, pour the sauce mixture all over the surface of the mushrooms. (The cornstarch in the sauce may sink to the bottom, so give the sauce a quick whisk before you add it to the pan.) Stir in the green onions. The sauce will thicken up fast and you need to keep adding about 1/4 cup of water at a time to the pan just to thin it out a bit. Don’t add too much water, though, as the end result should not be too “saucy.” You don’t want the mushrooms to look like they’re drowned in the sauce. Add just enough water to thin out the sauce so it doesn’t look like a lumpy goo. By the time the green onions are softened a bit, the dish is ready to serve. 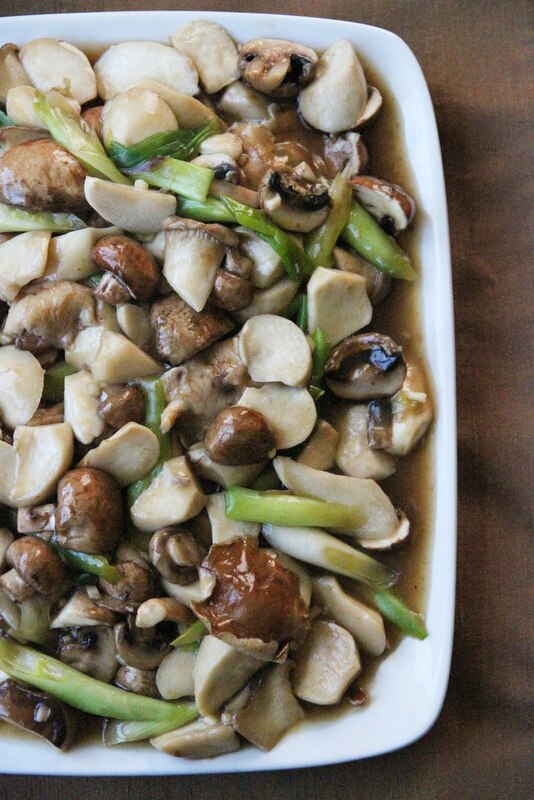 This mushroom stir-fry is great over steamed rice or cooked noodles. That sounds very tasty for such a low fat dish! Good luck with keeping away from the icecream. I’m so glad this is healthy as I love mushrooms! You’re a better person than I: a week without meat, dairy, starch or sugar would be unbearable torture (the best I can say is that I’ve cut back). But I might be persuaded if the alternative meals are just as delicious as this wild mushroom stir-fry! I love mushroom, specially the soup made from mushrooms… I really like it…. this was the first recipe of yours that i tried, and it was GREAT! i made it for my birthday dinner, and my entire family loved it, even my ridiculously picky brother, who only likes buttered noodles and cheese -_- just wanted to give u a much-deserved compliment! Mary – Aw, thanks. 🙂 Glad you guys liked it. I love the mushrooms in all shapes and forms.I must say, the photos are breathtaking! In the recipe, you suggest brandy (e.g. Cognac)as a replacement for the Chinese rice wine. Wouldn’t that result in quite a different flavour? I’ve heard of replacing rice wine with dry sherry, but brandy? Just being curious… Btw: fantastic blog, I love how you go into detail when you describe dishes and ingredients. I made pad pak boong the other day according to your instructions (except for the flame-frying) and it almost tasted like the last time I ate it in Thailand. Wonderful! Anon – Just a tad, but it will still taste good. Thank you for these explanations good work.